A field with a diamond pattern filled with quatrefoils and interlacing is followed by a line of drawn thread and a band of interlace kufic. The outlines of diamonds, quatrefoils, and scrolled interlacing are embroidered with flax thread, the background is filled with silk thread. The embroidery is extremely fine. An additional fragment of plain tabby linen is sewn to the kufic band with a flat seam. 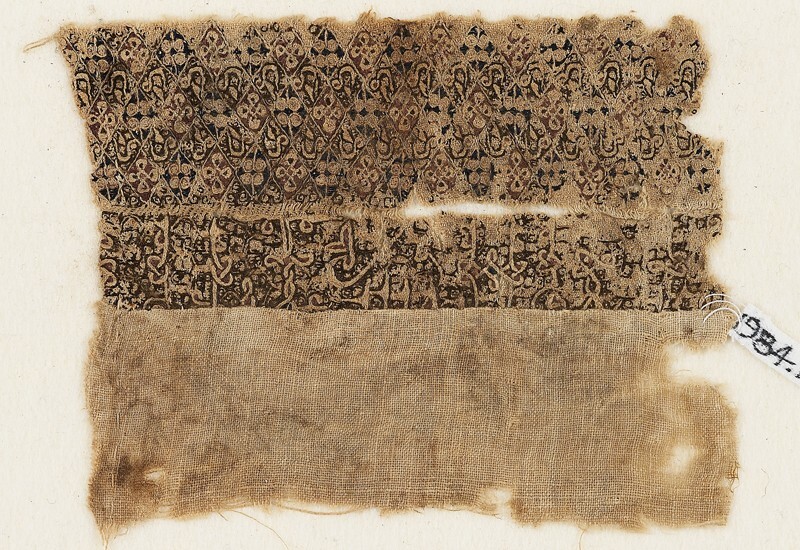 The uncalibrated radiocarbon date is 1036 AD +/- 35, but the calibrated date of 1030 to 1210 may place the textile into the post-Fatimid period, which is likely on stylistic grounds.